I have. Finished. An. Object. The reason I've amazed myself with this is that I am working on two endless projects: the small-gauge full skirt and the Kimono Shawl. The shawl is about half finished, the skirt maybe one forth to one third. Laura, the Scarlet Knitter has a rule of three though. She generally works on three projects at once. I think the designer's yarn choice is brilliant. The faded colors of Green Mountain Spinnery Cotton Comfort (wool/cotton blend, dk weight) of similar intensity give it a mellow, vintage/organic look. However, I had leftovers: Debbie Bliss Cotton Cashmere (dk) leftover from the Bandersnatch sweater, and I used it ALL up. I love putting leftover yarn to good use. I also love this yarn. It is soft and warm like worn flannel pajamas. I edged the blanket with Knit Picks Cotlin, a cotton/linen dk (see previous post), mitering rather than overlapping the garter stitch edging. The yarn is soft and knits up very well - a Knit Picks winner. The edging did not work perfectly as to pick ups along the row edges. 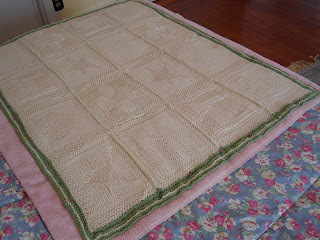 The first time I followed the rule of three stitches per each four rows, and it was too many. For the second edge I reduced the stitches, and it was better, but still a little flaring. Both side blocked out well though. I could have made the border wider, but I came to the end of the yarn. 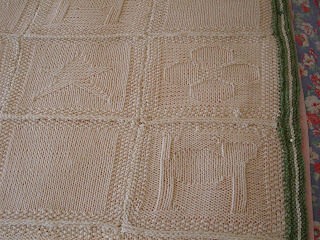 The squares, which measure 6.75 inches wide and 6.5 inches long, knit up in no time, but took a while to put together. 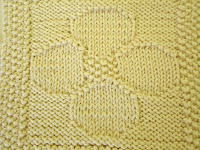 The squares are butted together and whip stitched from the back into columns, leaving a ridge between them. 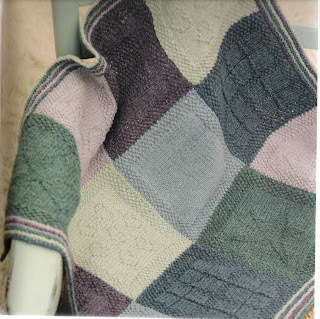 The expert knitter who made the sample in Louisa Harding's book somehow avoided the ridge. I would like to know how to do that. The columns are mattress-stitched together with no ridge, but leaving a visible seam in my version. It could have been better, but it doesn't look bad in person. I used Louisa Harding's charts for the star, heart, and plain square, but I designed my own cat and flower squares. These were fun and easy to chart. 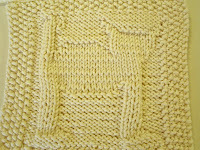 You can knit a picture of anything. Cute blanket! And I like your customizations. I like to have several projects going at one time: socks, something small, and something big. I try to keep at least one of them mindless, too. Eagerly awaiting the skirt! The blanket is lovely. And I completely agree as to multiple big/small projects. I generally have two pairs of socks on the needles for the "smalls" and 1-2 "big" projects like vests, shawls, or sweaters.